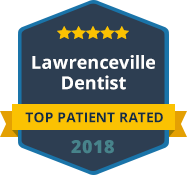 If you live in or around Lawrenceville and are interested in tooth colored fillings, trust the experts at Lawrenceville Family Dental Care. We are a comprehensive, family dental practice located in Lawrenceville and serving all of Gwinnett County and the surrounding areas. Our family dental practice treats children and adults of all ages with top quality cosmetic dental care including tooth colored fillings. Our practice includes a talented, experienced restorative dentist. Our dentist has a vast amount of experience placing composite fillings. Our natural looking, tooth-colored fillings are extremely durable and result in beautiful, long-lasting smiles. If you are tired of looking at your old, silver and gold fillings, or if you are in need of a new filling, schedule an appointment with one of our talented dentist today. For the highest quality natural colored fillings available in and around Suwanee, call Lawrenceville Family Dental Care. We offer fillings made of composite, a natural looking material that can be bonded to teeth to fill a space where the tooth has become decayed. Our composite fillings are beautiful in appearance, are made to last, and can be completed in a single visit. Since the composite material is actually bonded to the tooth, there are no filling leaks and less of chance of the tooth cracking. Lawrenceville Family Dental Care offers white fillings made of composite resin, as well as a full range of restorative dental procedures to the residents of Gwinnett County. If you or a member of your family is in need of a filling, contact our office today to schedule an appointment with our talented restorative dentist. We are currently accepting new patients and we accept most forms of dental insurance. Our practice also welcomes patients who are not currently covered under a dental insurance plan. We look forward to restoring the form and function of your smile with natural looking, tooth colored fillings.